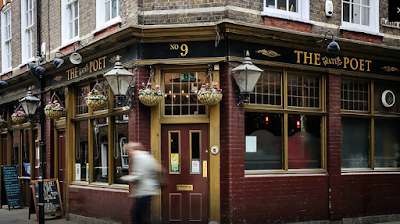 I am saddened that The Water Poet, that marvelous drinking establishment in Folgate Street, Spitalfields, is due to close. The immediate area is to be redeveloped, no doubt with more glassified blandification and Dubaiification. They say here that the pub will be opening up again nearby with the same name. But it won't be the same pub will it? You have until March 29th to pay your last regards – I will be in there this evening enjoying a pint or two with friends, probably in the garden if I can find a space... so do come and join me. I am not sure what is actually planned for this corner site once the pub closes. But check out what happened at The Gun on the opposite side of the market – The Gun was built in the late 1920s on a corner of on Brushfield Street but was closed when the Fruit & Wool Exchange was demolished all bar the façade. A new pub has since opened up on the same site and I can't be the only one to be aghast to see that it has been given the same name yet bears no resemblance at all to the old one. If I was the previous landlord or one of his regulars I would be disgusted and insulted by because it is now nothing like the proper old boozer it used to be – it now resembles a horrid chain hotel/cocktail bar. Hmmm. 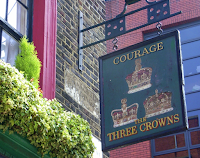 Check out also The Three Crowns just north of Old Street roundabout which a few years back was given a wash and brush up that holds the building there like some kind of historical little gem within a huge block of modern glass and metal. The pub has been 'renovated' involving the removal and/or replacement of anything that made it worth saving in the first instance. And they have painted the tiles! Yes; painted! if you paint tiles you then have to paint them again years later when the paint peels off. Tiles can be wiped clean. Muppets. Oh what do I know? !